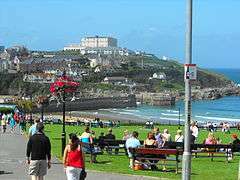 Newquay (/ˈnjuːki/, Cornish: Tewynblustri) is a town, civil parish, seaside resort and fishing port in Cornwall, England. It is situated on the North Atlantic coast of Cornwall approximately 20 miles (32 km) west of Bodmin and 12 miles (19 km) north of Truro. In 2001, the census recorded a permanent population of 19,562, increasing to 19,900 at the 2011 census. There are some pre-historic burial mounds and an embankment on the area now known as The Barrowfields, 400 m (1,300 ft) from Trevelgue. There were once up to fifteen barrows, but now only a few remain. Excavations here have revealed charred cooking pots and a coarse pottery burial urn containing remains of a Bronze Age chieftain, who was buried here up to 3,500 years ago. The curve of the headland around what is now Newquay Harbour provided natural protection from bad weather and a small fishing village grew up in the area. When the village was first occupied is unknown but it is not mentioned in the Domesday Book although a local house (now a bar known as "Treninnick Tavern") is included. 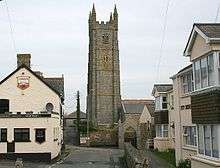 By the 15th century, the village was called "Towan Blystra"—-"Towan" means sand hill/dune in Cornish, "Blystra" meaning blown-—but the anchorage was exposed to winds from the north east and in 1439 the local burgesses applied to Edmund Lacey, Bishop of Exeter for leave and funds to build a "New quay" from which the town derives its current name. 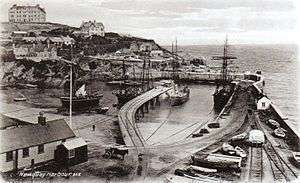 A 1904 image showing the Great Western Railway terminating at Newquay Harbour (top); the area in 2006 (bottom). The first national British census of 1801 recorded around 1,300 inhabitants in the settlement (enumerated as a village under St Columb Minor parish). The construction of the current harbour started in 1832. Newquay parish was created in 1882. A mansion called the Tower was built for the Molesworth family in 1835: it included a castellated tower and a private chapel as they were devout Roman Catholics. The Tower later became the golf club house. After the arrival of passenger trains in 1876, the former fishing village started to grow. Several major hotels were built around the turn of the 19th century, including the Victoria in East Street, the Atlantic and the Headland. The three churches were also built soon after 1901. The arms of the urban district council of Newquay were Or on a saltire Azure four herrings respectant Argent. Growth of the town eastwards soon reached the area around the railway station: Station Road became Cliff Road around 1930, and the houses beyond, along Narrowcliff, were also converted into hotels. Narrowcliff was first known as Narrowcliff Promenade, and then Narrowcliff Road. On some pre-war maps it is spelt Narrowcliffe. At the time of the First World War the last house at the edge of the town was a little further along present-day Narrowcliff, and in more recent times this building became the Garth Hotel. Post-war development saw new houses and streets built in the Chester Road area, accompanied by ribbon development along the country lane which led to St Columb Minor, some 2 miles (3 km) away. This thoroughfare was modernised and named Henver Road, also some time in the 1930s. Development continued in this direction until the Second World War, by which time much of Henver Road had houses on both sides, with considerable infilling also taking place between there and the sea. It was not until the early 1950s that the last houses were built along Henver Road itself: after that, there was a virtually continuous building line on both sides of the main road from the other side of St Columb Minor right into the town centre. The Doublestiles estate to the north of Henver Road was also built in the early 1950s, as the name of Coronation Way indicates, and further development continued beyond, becoming the Lewarne Estate and extending the built up area to the edges of Porth. Up to the early 20th century, the small fishing port was famous for pilchards and there is a "Huer's Hut" above the harbour from which a lookout would cry "Hevva!" to call out the fishing fleet when pilchard shoals were spotted. The town's present insignia is two pilchards. The real pilchards now only survive in limited stocks, but a small number of boats still catch the local edible crabs and lobsters. In 2012, the first phase of Surfbury began to be built (as local people have called it after the similar Poundbury). It is a Duchy of Cornwall planned development at Tregunnel Hill with 174 homes. More plans include further substantial development inland which has now begun, and construction on a large site known as Nansleden is now apparent along the Quintrel Road. Plans were approved for the development of 800 homes at Nansledan in December 2013. The Nansledan plan now includes up to 3,000 homes, shops, a supermarket, church and primary school. Places like Trencreek, Porth and St Columb Minor have long since become suburbs of Newquay: it is now quite possible that by the 2030s, should present development trends continue, the eastern edge of the town could encompass Quintrell Downs, 3 miles (5 km) from the town centre. In April 2012 the Aerohub enterprise zone for aerospace businesses was set up at Newquay Cornwall Airport. In September 2014, the UK's Homes and Communities Agency and the European Regional Development Fund agreed to fund the construction of a £6 million Aerohub Business Park there. Newquay St. Michael's, a large Anglican church in the Cornish style designed by Sir Ninian Comper, was built in 1911. There is a fine rood screen; the churchmanship is High. The church was destroyed by an arson attack on 29 June 1993, but has since been reopened (rededicated in 1996). 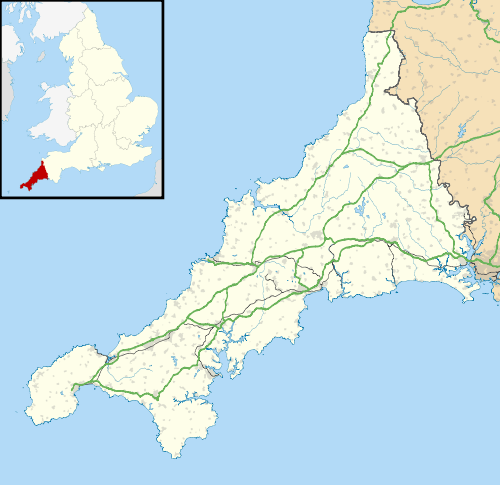 Most of Newquay was in earlier times part of the parish of St Columb Minor. A chapel of ease already existed before 1911 but the growth in population meant that it was no longer adequate. Arthur Mee in his Cornwall (King's England) describes the perpetual light maintained in the church as a memorial to the men of Newquay who died in the First World War. The stained glass windows and rood screen are also described: the main themes are St Michael, the three other archangels, and Jesus Christ and Mary the Blessed Virgin. Newquay Discovery Trail is made up of 14 Cornish slate discs, each 39 inches (0.99 m) in diameter, sunk into the ground at strategic points around the town. Each of the discs features a series of 'conundrum' words carved by sculptor Peter Martin. The trail starts in the centre of town at the Killacourt. Established in sections throughout the 20th century, Trenance Leisure Gardens are sited in a wooded, formerly marshy valley on the quieter edge of Newquay, stretching down to the Gannel Estuary. From the Edwardian era it provided recreation for tourists with walks, tennis courts and a bowling green, all still popular today. In the gardens, which are spanned by the arches of the stone railway viaduct, visitors have long been able to enjoy a stroll through the beautiful Trenance Gardens with their mature trees and heritage cottages, leading to the boating lake. This was dug during the depression of the 1930s as a work creation scheme. In the late 1960s, further enterprises were established by the council, including mini-golf, a swimming pool, the "Little Western" miniature railway and Newquay Zoo, which opened in 1969. Newquay is also known for the "Run to the Sun" event, which always takes place during the public holiday on the last weekend in May at Trevelgue Holiday Park. People visit the town in Volkswagen camper vans, Beetles and other custom cars. The 1,013 kilometres (629 mi) South West Coast Path runs through the town. Newquay has one higher education campus, Cornwall College Newquay, which is a member of the Combined Universities in Cornwall Partnership. It offers foundation degree courses in Zoological Conservation, Marine Aquaculture, Animal Science and Wildlife Education and Media. Appropriately, the campus abuts Newquay Zoo in the Trenance Valley. There are also two secondary schools: Newquay Tretherras is a state-funded academy with specialist Technology College status, and Treviglas College is a specialist Business and Enterprise College. Among many schools evacuated to Cornwall (notably Benenden Girls' School), 240 boys and 20 masters of Gresham's School were evacuated to the town from Holt, Norfolk, during the Second World War, between June 1940 and March 1944. Devon and Cornwall Constabulary maintains a substantial police station in Tolcarne Road, and the Major Crime Investigation Team for Cornwall works from there. The modern day-staffed fire station in Tregunnel Hill is run by Cornwall County Fire Brigade, and is the home of one of the two aerial ladder platforms based in Cornwall. Ambulance cover is provided by the South Western Ambulance Service NHS Trust from an Ambulance Station in St Thomas Road. Newquay Hospital is also at the end of St Thomas Road, and is a local hospital catering for both in- and outpatients. The nearest general hospital is in Truro. Proposals in recent years for the Newquay Growth Area, east of the present town, have included a new and larger hospital. Newquay also has a 14 personnel coastguard rescue team based at Treloggan Industrial Park and an RNLI lifeboat station based in the harbour. An active local user group is campaigning for the line to be upgraded, not merely with at least one additional platform to be provided at Newquay, but also for passenger trains to run from St Dennis Junction (near St Columb Road) to Burngullow, on the Cornish Main Line west of St Austell. This would require the restoration of several miles of track, and also the improvement of a China clay line which still operates between Parkandillack and Burngullow. This route was proposed in 1987 as a possible replacement for the line to Par, much of which could then have been closed. However, although the British Railways Board obtained the necessary legal powers, the plan was not carried out. After BR passenger services were franchised in 1996 and 1997, the line was operated by Wales & West (originally South Wales & West) from October 1996. Wales & West was a franchise owned by Prism Rail, but Prism did not stay the course: it was taken over by National Express in early 2001 and the Wales & West franchise was then divided, its South West of England area becoming Wessex Trains. This situation lasted until April 2006, when the Wessex franchise was absorbed by the new Greater Western franchise, which is now known as Great Western Railway. Newquay Cornwall Airport provides links to many other parts of the United Kingdom. It is an HM Customs port, because it also handles increasing numbers of foreign flights, both scheduled and chartered. 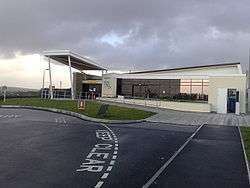 Newquay (NQY) is the principal airport for Cornwall, although there are several minor airfields elsewhere in the county. National Express runs coaches from various parts of Great Britain to Newquay. Newquay has a good local bus network: the principal operator is First South West. The bus station is in Manor Road, which runs parallel to the main shopping area of Bank Street. Newquay has two Non-League football clubs Newquay F.C. who play at Mount Wise Stadium and Godolphin Atlantic F.C. who play at Godolphin Way. Newquay also plays host to the Newquay Road Runners who are based from the sports centre. Newquay is also home to the reef known as the Cribbar. With waves breaking at up to 20 feet (6 m), the Cribbar was until recently rarely surfed as it requires no wind and huge swell to break. It was first surfed in September 1965 by Rodney Sumpter Bob Head and Jack Lydgate then again in 1966 by Pete Russell, Ric Friar and Johnny McElroy and American Jack Lydgate. The recent explosion in interest in surfing large waves has seen it surfed more frequently by South African born Chris Bertish, who during a succession of huge clean swells in 2004 surfed the biggest wave ever seen there. ↑ "Cornish Language Partnership : Place names in the SWF". Magakernow.org.uk. Retrieved 16 August 2013. ↑ "Table KS01". Census 2001. ONS. ↑ "Town population census 2011". Retrieved 10 February 2015. ↑ "The Barrowfields". Newquaytowncouncilcornwall.co.uk. Retrieved 16 August 2013. ↑ "Archaeological work at Scarcewater reveals rare & interesting finds". Cornwall County Council. Retrieved 16 August 2013. ↑ "A Short History of Newquay Harbour". Retrieved 5 September 2010. ↑ "Newquay article in Genuki". Retrieved 13 February 2010. ↑ Pascoe, W. H. (1979). A Cornish Armory. Padstow, Cornwall: Lodenek Press. p. 134. ISBN 0-902899-76-7. ↑ "Work due to start on 'Surfbury' scheme". Western Morning News. Local World. May 16, 2012. Retrieved 9 August 2016. 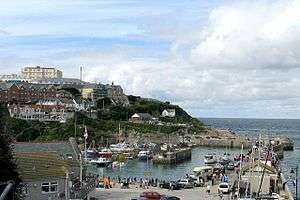 ↑ "Duchy of Cornwall plans for 800 Newquay homes approved". BBC.com. BBC. 20 December 2013. Retrieved 9 August 2016. ↑ "Aerohub business park at Newquay Airport to gain £6m investment". BBC News Online. 5 September 2014. Retrieved 7 March 2015. ↑ "1976 temperature". KNMI. Retrieved 16 August 2013. ↑ "1987 temperature". KNMI. Retrieved 16 August 2013. ↑ "St Mawgan Climate". UKMO. Retrieved 1 September 2012. ↑ "St Mawgan extremes". KNMI. Retrieved 12 November 2011. ↑ Long, Peter (2002). The Hidden Places of Cornwall. Travel Publishing Ltd. pp. 78, 79. ISBN 9781902007861. ↑ "Newquay Discovery Trial". Newquay.oldcornwall.org.uk. Retrieved 16 August 2013. ↑ This is, Cornwall (May 19, 2010). "Treasure Trail Open Weekend". West Briton. Retrieved May 19, 2010. ↑ "Newquay Facts". Newquay-harbour.com. Retrieved 2016-10-20. ↑ "WW2 People's War - My Wartime Memories". BBC. 2005-07-02. Retrieved 2016-10-20. ↑ "Newquay Hospital". NHS Choices. Retrieved 20 November 2013. ↑ "Network Rail". Network Rail. Retrieved 16 August 2013. ↑ "About". Newquay Cornwall Airport. Retrieved 20 November 2013. ↑ "Local Area". Newquaytowncouncilcornwall.co.uk. Retrieved 16 August 2013. ↑ "Surfing The Cribbar Newquay, Cornwall". Retrieved 1 July 2010. ↑ "Fistral Beach - North Cornish Coast, Cornwall Beaches". 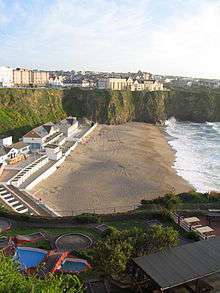 50.418253;-5.097656: Cornwall-beaches.co.uk. Retrieved 16 August 2013. ↑ Silver, Katie (6 February 2012). "Perfect for a Bond villain: One of Britain's most exclusive homes perched on a rock goes on sale for £1m". Daily Mail. London. Retrieved 16 August 2013. ↑ "Phillip Schofield Online". Schofieldfans.co.uk. Retrieved 16 August 2013. ↑ Guardian, Cornish (8 February 2012). "Scrap Twinning Link Says Ex Mayor". Cornish Guardian. Retrieved 9 August 2016. ↑ "Most Popular Titles With Location Matching "Headland Hotel, Newquay, Cornwall, England, UK"". IMDb. Retrieved 20 November 2013. ↑ Duncan, Fiona (9 August 2016). "The Headland Hotel Review". Retrieved 9 August 2016 – via telegraph.co.uk. ↑ "The Beatles, John Lennon, Paul McCartney, Ringo Starr and George Harrison, Photo stock Archive by Chris Walter". Photofeatures.com. Retrieved 16 August 2013. ↑ Oliver, Amy (15 October 2012). "The Magical Mystery Tour of Newquay". The Mail on Sunday. Retrieved 9 August 2016.